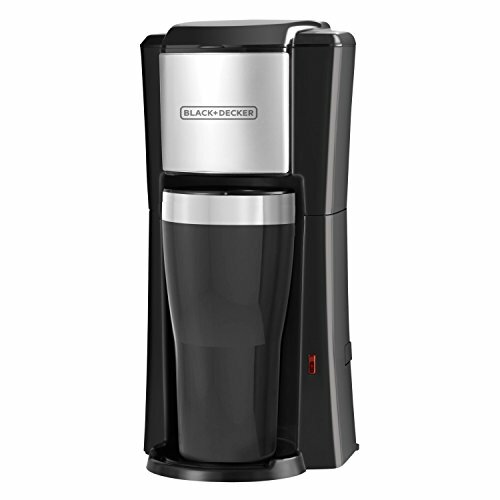 Hey guys and girls, are you seeking a good coffee maker for your dorm room? One that’s not humongous (preferably) and nice to look at too? Caffeine and collegiate life always go hand in hand, right? They easily stand toe to toe with midterms, fraternities, and parties. When I was attending the only appliances most of the other students had was a small cubic fridge and a microwave. Alright, let’s dive in right now, shall we? 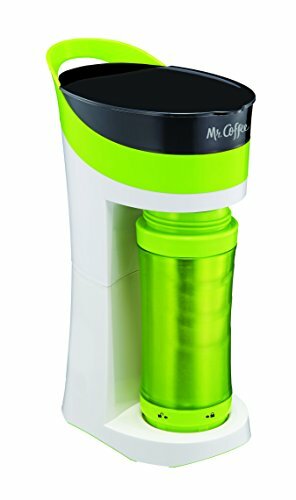 Mr Coffee Pour Brew Go! 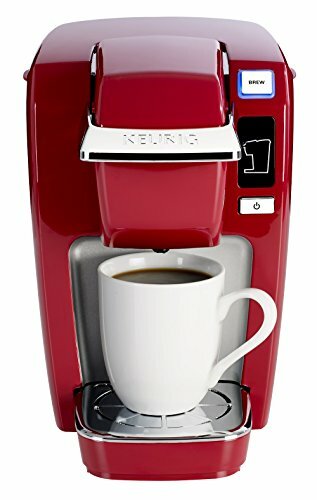 This little beauty is a close cousin of the K-Select (which is also a great choice as far as a best choice of a Keurig for the dorm room) It’s got a lean, mean look, and a minimal electric footprint. and a 36-oz reservoir which is smaller than average; being about enough for 3 8-oz cups, so if you’ve got a roomie you’ll be able to share a little. 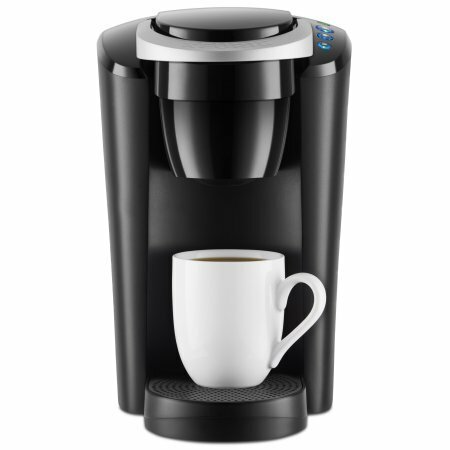 With 6, 8 and 10 oz brew sizes, you can get a hot beverage going in just under a minute. If you remove the drip tray, you should be able to get a cup with a max height of 7″ to fit in place. Auto-shutoff goes into effect after 2 hours of inactivity giving you a worry free experience when you get out the door in the morning. Lastly, you have three others color options besides black – red, turquoise, and gray. This is the smallest Keurig, and the perfect Keurig for the dorm due to size alone. It’s the successor to the K10 which I own and I enjoy mine enough to vouch for the performance you can expect. Three brew size settings and many beautiful colors to choose from so if you want to jazz up your living space you have options like red, royal blue, or lavender. 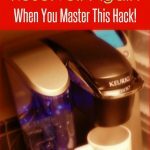 You can use K-cups or refillable K-cups too if you want to save a little money and use your own grounds. I understand the essence of frugality when you’re in college and you want to make every dollar count! It has auto-shutoff for the essence of hakuna matada on those rushed mornings before class. Only negative that I can see is that this particular Keurig does not accommodate travel cups . About 6″ is the max height of a cup (with the drip tray removed), so something to consider if you’re looking for a brewer that will accommodate “to-go” cups. 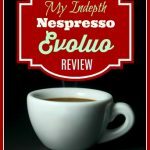 This guy is perfect if “to go” coffee is high on your list! This compact brewer comes with its own 16 oz take-anywhere tumbler. With an orange indicator light and auto-shutoff, this is the perfect take-along on your college life journey. 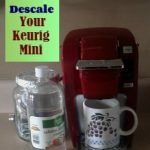 Not only is it a sleek, space-saving unit, the 7″ tall included tumbler is also designed to fit into your vehicle cup compartments easily as well, for those of you who many have some commuting from time to time. Only downside is that this model is not one that uses K-cups….you can use loose grounds or soft pre-packaged coffee pods (however less expensive than K-cups in general) that are compatible with the permafilter and basket -cleanup is a breeze and yet one thing off the table for those days when you don’t feel like cleaning an appliance from top to bottom. In a scenario such as a crackerbox dorm room in which every inch counts, this is one little pod brewer you should give some serious attention to. 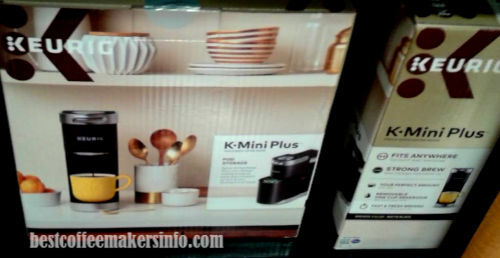 The k-cup stowaway compartment needs to be moved prior to use. 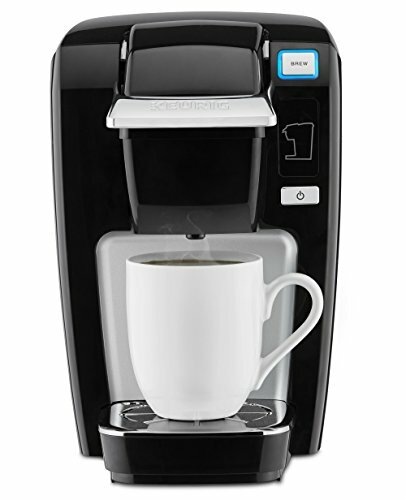 Other features include 6-12 size brewing options, a “strong” button that will give you a little bit richer flavor, and yes, you can also use refillable k-cups whenever you want to use your own personal coffee grounds. Only “con” is it will not seat tumblers as its max height for cups is 6″. Choose from black or red and sit back, and thank me later, when you can set this on your dresser or desk, and have enough room for all of your other possessions. 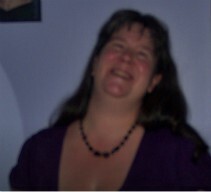 OMG…What’s not to love about this one? Portable, includes a matching 16-oz tumbler -and comes in 5 gorgeous colors in addition to black: orange, purple, pink, apple green, and blue. The tumbler is also in the pretty color too. The tumbler has a handy ring on top for easy carrying when you are heading to class. 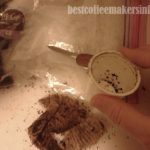 You can use your own grounds (not a K-cup brewer, again, but I think the benefits outweigh the loss of not using them.) Guys and girls alike will love this one and it’s sure to become their next BFF as far as appliances go! And don’t forget, you can also use one of these brewers to heat water for ramen noodles (Hope that doesn’t sound too cliche?) and other food products. 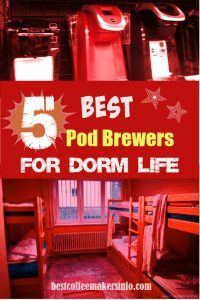 Best of luck to you in searching for a great pod brewer for the dorm and best of luck in your schooling! 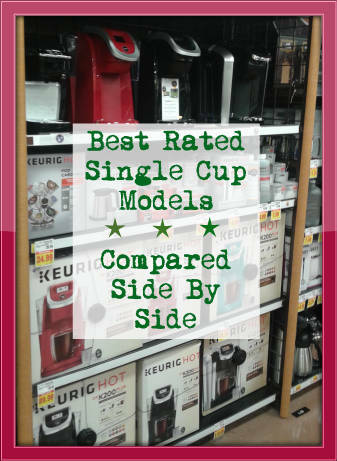 Well that’s my lineup of the five best coffee makers for the dorm room – What do you think? Which one’s your favorite? Let me know in the comments section!